Help Is the result worth the time? Discussion in 'Painting and Converting' started by inakue, Feb 6, 2019. 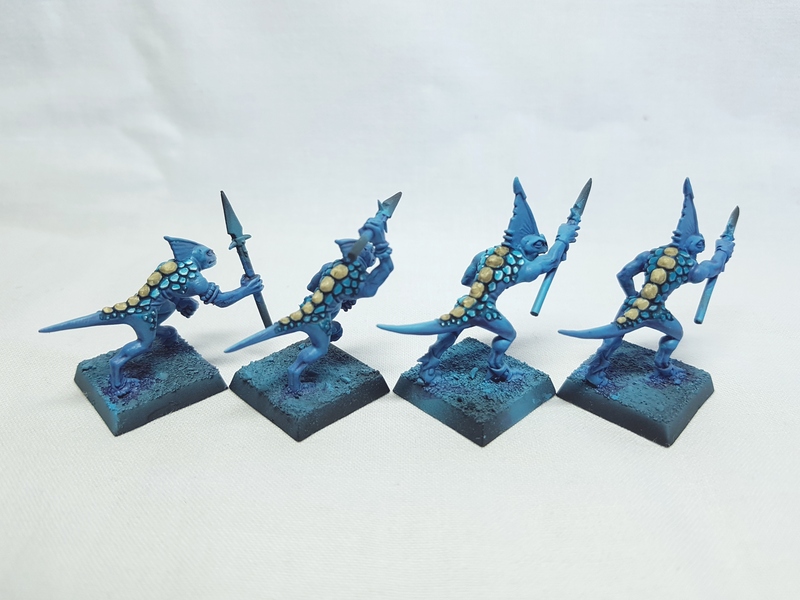 As I posted in Let's Get Motivated - February 2019, I am currently painting about 60 skinks for my army. I painted 30 2 years ago for my Lizardmen army, but I am planning to play AoS and therefore should paint some more. You never own enough skinks. Well, the thing is: Should I spend 15 mins per miniature on painting the scales of the little lizards at a good level or just leave it the way I used to paint them but at a lower level? 15 minutes may not sound a lot, but take into account the total amount of skinks is 100 more or less, that is 25 hours. I think I could try to reduce the time to 10 minutes per mini when I get more used to the painting style, but even then it is worth considering. Captaniser, Warden, ASSASSIN_NR_1 and 2 others like this. It really depends on what you want from your models, on the tabletop no one will notice that you have spent 15 minutes on the scales, what I have done with nearly every model that I use for games is used the GW system, base, wash, drybrush and a bit of detail, on leaders etc spend the extra time to blend etc. Also something that will decrease your time is spray the base coat, depending on what colour your doing them. Karnus, Acrocanth, Cageyblood and 2 others like this. I have no clue how much time I spend on a single Skink... I normally badge paint 20 at a time. Blue primer, blue shade, light blue drybrush, yellow eyes, brown wood and bronze on the metal parts. In a pinch you can omit teeth and claws but they are quick to do. My feeling says that should be less than 10minutes per Skink but I could be wrong. Cageyblood, Warden and LizardWizard like this. For the painted skinks on the picture I used: Black primer, Light blue airbrush base color, violet shade with citadel ink, then cenital lightning with the base color again but I think I should highlight them more. 2. Complex highlight from white to turquoise, takes me 12 I guess. I refuse to use drybrush on skin textures since I think the result is not good enough. Obviously, for batch painting it is really time friendly. I am thinking of preparing an army display board for the annual painting contest they make in my city, so I should probably paint them with the complex method butttt awww!! That takes a lot of time! Cageyblood, Crowsfoot, Warden and 2 others like this. Can you go in depth? I really like the result and is of the philosophy that even though it might take more time, it is worth it since you yourself will be more satisfied with the result, and that is really all that matters; It then of course depends on what you are satisfied with. If you want to save some time now and get them painted to be ready for play, I would go with Crowsfoot's suggestion and add details later. #1) I would go with what makes you happy. The first (and only) person's opinion you really have to worry about at the end of the day is your own. #2) That in mind, if you are thinking of displaying the army, or more specifically putting them into a competition/army on parade event or something at a local store, it may be worth spending that little "extra" time on a model that your talent and patience can provide to make them look that much better. At the end of the day, have fun with it. Cageyblood and Crowsfoot like this. I was the same really, I have just bought 2000 points of Troggoths and I am going to paint these to a very high standard, airbrush will be used to blend rather than layers, not as precise but still excellent results. You need to look at @Itepixcauh army, he has taken his time, refused to cut corners and the results are stunning, so if you want a display quality army stick with it. Downside is you will take a LONG time to finish the army, mine is 4 years in the making. Almost finished now. Cageyblood, Crowsfoot and Warden like this. Jeez I consider myself lucky if I only send an hour on a skink. 10 minutes is incredible! If you follow the Warhammer tv youtube account you can see they've had some non lizard painting tutorials lately for quickly painting a bunch of infantry units like skaven using a few colours and steps to get a board worthy model quickly. You are only ever living up to your own expectations. Only you can look at a model and decide if you are happy with it, it will either bring a smile to your face or you'll shake your head and decide you are gonna re-do it. My approach for example is EVERYTHING must be at least a decent tabletop standard. all details picked out, base, shade, maybe a couple of highlights if I can be bothered. The only exception is hero/lord models or large centre pieces where I spend a bit more time on them, but rank and file are only on the board for mere minutes sometimes so what's the point? they get hit by the pie plate and your taking them off in droves. But that's just me. Take my mate for example, EXCELLENT painter, really really good. Takes pride in every single model he paints and his warriors of chaos army looks stunning, like heavy metal standard stunning. Buuuut he is willing to spend a lot more time on his models, he has a chimera he has been painting for months, layering and layering and glazing and glazing annnd yes it looks drop dead gorgeous. Could I do that? if I gave it the time maybe I could. Will I do that? Nah. But I am happy with that. I enjoy painting but I like playing the game more, my mentality is that as long as the army looks uniform and I am happy, screw everyone else. TLDR: Do what makes YOU happy! Aginor, Cageyblood and Crowsfoot like this. Itepixcauh, Cageyblood, Crowsfoot and 1 other person like this. Do whatever you feel best about. Those skinks might seem to be puny, but they are an expression of your creativity and I really like what you did with their scales! That would be totally worth the extra time in my opinion. To avoid cognitive stress, you could variate the shade of the color for every batch of, say 10 skinks a little. You would have less of the feeling to have to do a chore, it would be an eye catcher and could help differentiate units of 10 on the battlefield. Mixed up in bigger units it would not be that obvious, since color variations in skin are organic.